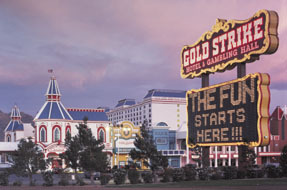 Gold Strike Hotel and Casino is an entertainment and recreation land establishment introduced in 1990. It is situated in Jean, Nevada, not far from CA state line and approximately 33 miles from Vegas downtown. 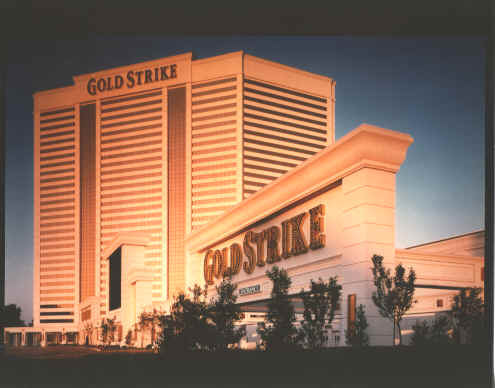 MGM Resorts International has owned Gold Strike hotel. The Gold Strike Hotel & Gambling Hall will definitely provide all guests with comfortable stay as it has 881 spacious greatly furnished hotel rooms with features that can satisfy even the most nagging clients. There are smoking and nonsmoking areas, queen and king size beds, high speed of internet access, etc. This hotel belongs to those types that are mostly in demand amongst older gambling crowd. MGM Mirage took care about its status and conditions which will fit its customers. There are 5 restaurants intended for various clients` tastes inside the hotel: from simple cafes, snacks and Chinese food to big restaurants and steakhouse. The casino occupies huge 34,998 sq ft area and welcomes all gamblers 24 hours daily. There are 650 gaming machines that include 190 nickel slot machines, 150 penny slots, 234 quarter machines, 150 1-dollar slots, 21 5-dollar machines and 100 slots of various denominations. There are 6 tables for blackjack, 1 roulette table, 1 for craps, one more for Caribbean Stud and one for poker.